Do you have a child who just loves trucks, especially fire trucks and ambulances? Are you seeking something creative to do with the children that will teach them about safety while they're having fun? You can take them to the local fire station to meet a fireman, see the trucks, and get a tour of the station. It's free! Keep in mind these are working fire stations, so the crew could be dispatched for an emergency while you are visiting. That just adds to the excitement! TIP: Have your child wear his favorite "fire gear" for a full experience. While you are welcome to tour any fire station within Collin County, it may be a good idea to visit your local fire station so your children become familiar with the firemen who may come and rescue them during an emergency. Read on for what each city fire department offers touring guests. If you're looking for a fire station, or even a fire museum, where you're allowed to host your birthday party (for free! ), click here. Tours may be scheduled between 8am-8pm daily, with a minimum two weeks notice. While there is no age limit for tours, the group maximum is 20. Groups are requested to have at least one adult per four children. Visitors will tour the station, see the firefighter' kitchen, living areas, and tour the bay where the fire engines and other vehicles are stored. Guests will be able to take a photo on, or in, the fire engine! Tours are limited to Allen residents, schools, day cares, home school children, scouts, clubs, and organizations. Chief Gothard encourages residents to tour their local fire station. Tours are typically limited to M-F, 8am-5pm; weekends by appointment. All ages are welcome and there are no group minimums for a tour or the station and trucks. Guests may be able to have a photo taken inside the fire truck if assisted by a fire fighter. If time permits, a fire fighter will put on his bunker gear so children become acquainted with how a fire fighter will appear in the event of a fire. The station is open to all Collin County residents. Visitors are welcome to the fire station based on the availability of the fire fighters, typically between 8:00am-5:00pm. There is no minimum age for visitors, but the tour is typically most enjoyed by children ages 4-12. Guests will tour the fire station and view the fire trucks. Fire fighters will be happy to put on their bunker gear to acquaint children with their appearance should they be rescued during a fire. Chief Morris encourages guests to climb onto the fire truck for pictures at the station during a tour. Visitors will learn about the different types of trucks and their uses. Typically one of the fire fighters will "bunk out" in their gear. The tour is open to people of all ages and do not need to be a resident of Farmersville or Collin County. As this is not a full-time department, it may be a good idea to call ahead. "Our house is your house" is the motto of the Frisco Fire Department, so families are welcome to schedule a free tour by calling the number above. Visitors will get to meet the firefighters and check out the fire engines, ambulances and see the living area where the firefighters stay when not responding to calls. It is recommended to schedule an appointment to be certain the crew is available prior to visiting. Note: Firemen typically will not put on their bunker gear as part of the tour. The Fire Chief asks that you call ahead if you'd like to visit, although it is not required. Visitors will get to tour the entire station and "absolutely" get to climb on the fire trucks and get that perfect selfie from inside the truck. Visiting hours are 10am-8pm. There are no group minimums or age restrictions, as long as parents accompany minors. Please make an appointment by visiting with the website and filling out the Public Appearance/Community Outreach Request. The Fire Museum is located in an actual fire station, so kids five and up can learn about the history of the museum and then walk around the fire trucks, touch them, and climb into the fire trucks while firemen explain the equipment to them. If requested, fire fighters will step into their bunker gear so kids can see what a fireman will look like if he comes to rescue him at a fire. The best part of the tour? Watching a fireman slide down the pole! See photos of the fire museum here. Chief Watkins personally wants to invite the community to visit the station and learn about their fire department. While there are no set hours for tours, the chief asks that any extended visits be scheduled so visitors will receive their undivided attention. Tours are designed for the age of the audience, but typically visitors will receive a brief tour of the station, apparatus, and the fireman's personal protective gear. You are welcome to take photos and some may board the rigs for a better view. Visitors needn't be Melissa or Collin County residents. Because Murphy has one fire station, you are welcome to drop in any time during the day but it is best to schedule your tour ahead of time. Guests will see the entire fire station and the fire apparatus including a fire engine, ambulances, Squad Chief Officer Vehicles, and even an event mule cart. There is no age minimum or group number restriction. No need to schedule an appointment any day of the week (including weekends) from 8am-5pm, just stop in--unless your group exceeds five people. Visitors will get a first-hand look at fire station facilities (kitchen, day rooms, training rooms, bedrooms, and fitness centers) as well as tours of all available station apparatus (fire truck, fire engine, ambulance, and/or rescue squad) depending on which station you visit. If requested, firefighters will put on their protective bunker gear provided it is clean and safe for children to touch. While kids are not permitted inside the fire trucks, parents are welcome to take photos of children with the outside of the truck. The tour is recommended for children four and older, and adult supervision is required for all minors. It is best to schedule an appointment through email. Half hour visits are welcome Monday-Friday, 9am - noon or 1-3pm. Children of all ages are welcome with an adult. Ask the firemen to don their gear and they'll try to oblige. You may even be able to get into the passenger compartment of the apparatus for the full experience! Groups are limited to 15. Fire station tours are encouraged during daylight hours. 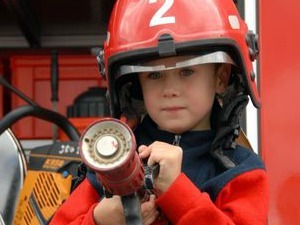 You'll receive a guided tour of the fire station, fire trucks, and even be able to take a photo on, or in, the truck! Just ask the fireman to put on his bunker gear and he'll be happy to oblige. Folks are welcome to stop in or schedule a tour Saturdays and Sundays from 1-4pm. As this is a small fire department, it's best to schedule your visit to be certain the firemen are on site. Ask the fireman to put on his bunker gear, sit in the driver's seat of the truck for a photo, and tour the station. The equipment at the fire station varies, so choose the one that is of most interest to you. Station 1 has a quint, medic, brush truck and ATV. Station 2 has a quint, medic, paramedic squad, reserve equipment, and the training field. Station 3 has a quint, medic, and all of the special operations equipment. Boat, and hovercraft.